PARIS, Jul 11, 2014/ — Entitled “Niki with Love”, the Coppélia Pique couture Fall/Winter 2014-15 collection is more a tribute to than a study of Niki de Saint Phalle. 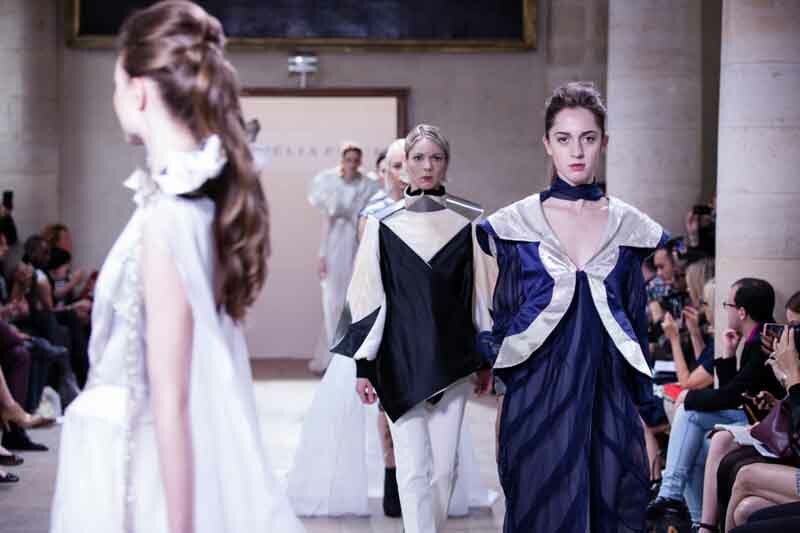 After graduating from the ENSAD in Paris, Axelle Migé’s work became a fusion between Beaux-arts and fashion. Through the work of Coppelia Pique it’s the world of Niki de Saint Phalle, full of femininity and love that opens to us. Mixing noble fabrics like chiffon silk, organza, crepe silk, cashmeres and fabrics coming from the arts and crafts like feathers, shells, pearls or metal, gold and silver foil, mosaic and resin, Coppélia Pique unveils the different elements which compose her creation and were part of the life of this artist. A complete wardrobe, interpreting her style and her beauty are put in parallel and even in confrontation with her works of art. The body becomes a work of art. These elements are intertwined in androgynous looks with unusual volumes, reminiscence of the brand signature.